This quote is attributed to Abraham Lincoln. Whether he actually said this or not is immaterial, the concept is sound. If you are given a task, using the best tools you can to do the job helps you to perform the task more efficiently and effectively. 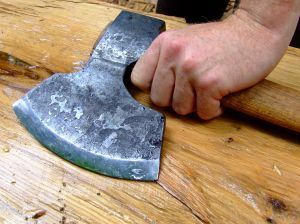 A dull ax will take longer and require more strength. Over the years, I’ve often questioned what my true mission is. I’ve received revelation from God over that time, yet I still question and wonder if I’m following the right path. Is my ax sharp enough to do the task that God has put before me? Before heading out on mission from God, sharpen your own ax by getting yourself straight with God, praying and reading the Bible. I find that often I’m looking for how to best serve God and I realize that I don’t take time to read the Bible. I find that I struggle to start the day with prayer and I’m too tired at night to end the day with prayer. Throughout the day, I’m way too busy with too many things on my mind, that taking the time for even a short prayer in the midst of my busy day is beyond my thoughts. How can we be the most effective tool for God, if we don’t allow Him to sharpen us? God sharpens us through the reading of his word. We find out his mission for us through reading and prayer. God has given us the tools to do the job he set out for us wherever we are, whether on the mission field or at work. God has given all of us the tools, but so many of us (myself included) don’t bother to pick the best tool for the job. We choose a dull ax to chop down the tree. We strain ourselves to do the job God has put before us. We work so hard at His mission for us, that we fail to sharpen our tools. Prayer and reading of His word will sharpen us. If we spend the time sharpening our tools, we will be able to do His work so much more efficiently and effectively.